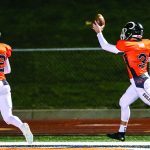 Rockford knew they would be up against it in their regular season finale against a powerful contingent from East Kentwood on Friday, October 19th. The Falcons were putting up 50 points a game with an offense that took a back seat to nobody since losing their opener in 2018. The Falcons had already clinched a share of the OK Red crown and a victory over the Rams would ensure they would share it with no other team. The Rams could have secured a share of the title with a win and for a huge chunk of the game they looked as if they were up ton the formidable task. 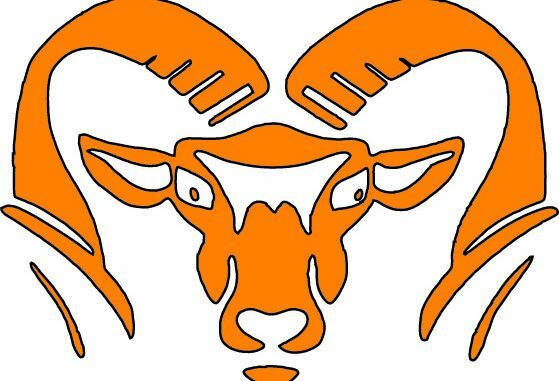 But after taking care of the ball with zero issues over the first 39 minutes of the game, the damp conditions suddenly reared their ugly head and a crucial turnover combined with several other miscues doomed the Rams to a 28-17 defeat. The loss left Rockford at 5-4 on the season and in peril of missing the MHSAA playoffs for the first time since 1994. 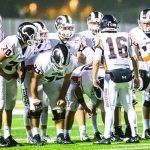 But the Ram’s strength of schedule paid dividends and the Rams made it 24 consecutive berths when the field was announced on Sunday evening. The Achilles Heel of the Ram defense in several contests this year has been the propensity to give up chunk plays. That was how this game started as the Falcons ran off plays of 40 and 42-yards in their opening possession before scoring with just over a minute elapsed in the contest to take a 7-0 lead. But Rockford had a quick retort as they marched 79 yards in nine plays to knot things up at 7-7. The scoring play was a beautifully thrown pass from Chris Corey to Eli Haddad that was right on the money and caught the speedy Haddad right in stride to complete the 46-yard touchdown. Teagen Lenderink added the point after and it was 7-7 with 5:48 left in the opening quarter. The Rams allowed only one other score in the opening half to the potent Falcons. That score came on a 40-yard run at the 6:03 mark of the second quarter to make it a 14-7 Falcon lead. 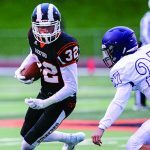 The Rams stymied a pair of other EK drives with huge defensive plays that kept them right in contention. The first was an interception from Alex Miller in the Ram end zone that he ran back out to the 35-yard line. The next was a fumble recovery at the Rockford 7 from Austin Klein that again kept East Kentwood off the scoreboard. The half ended at 14-7 EK and for the first time in a while the Falcons knew that it would be anything but easy pickings to secure a solo title. Rockford would receive the second half kickoff and hoped to make a dent in the seven point Falcon lead. They did just that on the back of a tremendous game long effort from junior fullback Jaiden Friesen. EK fielded no fewer than four NCAA Division 1 players on the offensive and defensive lines. But Friesen repeatedly gashed them for solid gains while bulling his way through multiple defenders repeatedly. That was mixed with a dose of solid runs from Connor White and Jack Richardson that also kept the chains moving for the Rams. Rockford managed to take that second half kickoff all the way downfield to the Falcon 25 before the drive stalled out. But out trotted Lenderink in the miserable playing conditions to attempt a 43-yard field goal. The kick sailed through the uprights and after running nearly eight minutes off the clock it was a 14-10 contest late in the third stanza. After stopping EK on a fourth down play early in the final quarter, the Rams appeared primed to again methodically march their way down the field in hopes of taking the lead and silencing a hearty home crowd that was eager to see the Falcons reign alone. But disaster struck as a fumble from Rockford was recovered after yet another solid gain on the ground that gave the ball back to the Falcons at the Ram 34. Four plays later EK cashed in to push the lead to 21-10 and take the air out of the sterling effort from Rockford. The Rams proceeded to fumble on three of their next six plays and despite recovering every single one the loss of yardage play after play soon gave the ball back to EK in prime field position inside the Ram 40. Once again the Falcons reached pay dirt in short order to push the lead to 28-10 with only three minutes left to play. To their credit, Rockford rounded up the wagons for one last drive and scored a touchdown with .6 seconds to play on another TD pass from Corey. This time it was Nate Bareno who gathered in the 24-yard scoring pass that made the final score 28-17 after Lenderink again added the PAT. Now the Ram will ready themselves for the post season. The festivities begin this Friday, October 26th in Traverse City at 7:00 P.M. Thirlby Field will be the site and Traverse City West will provide the opposition. The 7-2 Titans have never beaten the Rams in eight previous meetings and will be keen to do so this time around.